about the British Home Guard. N.B. All locations are listed alphabetically within the above sections. Listings are on the basis of 1940s county boundaries - thus Birmingham is in Warwickshire, Wolverhampton in Staffordshire, Bristol in Gloucestershire, Cardiff in Glamorgan, Edinburgh in Midlothian, etc. London is however London. The dates shown are those of a recent addition within the section. THE HOME GUARD AND THE 32nd BATTN. Shelfield, Streetly, Walsall Wood and neighbouring areas. Normal Google search methods apply although the results will be limited to this website only. INSERTING YOUR SEARCH OBJECT - the normal Google methods apply. THE RESULTS - will appear in the normal Google format. They will show the page(s) in which your definition appears. object of your search highlighted. The results page will not show a link back to this page. (Please note that this website is regularly archived by the British Library and therefore all its content will theoretically be available to future researchers in perpetuity). TECHNICAL NOTE : this page like the rest of the website has been designed for I.E.4+ and display settings of around 1024x768. Other browsers such as Firefox and Opera, and other monitor settings, for example those used for widescreen displays, may cause occasional distortion in the layout of the page, font changes and other aberrations. In every case, however, the page in question should remain legible and fully functioning. If you wish to view the page in its original, intended form, please download using I.E. THE SMALL PRINT: This website is entirely non-commercial. 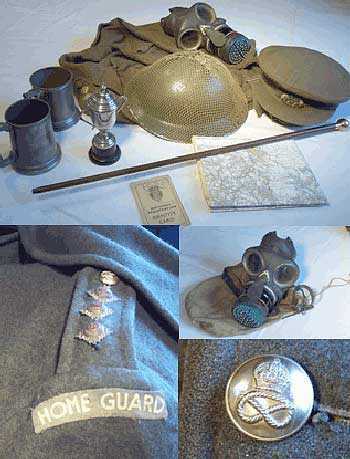 Parts of it are based on various Home Guard contemporary commemorative booklets, including "Home Guarding" published in 1945. It must be assumed that copyright for these publications is still owned by the writers and their descendants. The Webmaster regrets any technical infringement of such rights in the interest of commemorating the men and women of the Home Guard who gave so much; and to protect the owners’ interests must stipulate that the reproduction of any part of this site for commercial gain, or for any purpose other than personal study and enjoyment, is not permitted. With regard to all other third party material appearing within this website the same considerations apply. Every effort has been made to acknowledge ownership and wherever appropriate to obtain explicit permission for its reproduction. If the owner of any material which appears is not entirely happy with the manner in which it is used, or feels that his or her rights have not been properly observed, they are asked to contact the Webmaster who will take immediate remedial action. All other material is © staffshomeguard.co.uk 2005-2016. Whilst mention of individuals within the site is almost invariably couched in the most complimentary of terms, if any visitor is caused distress by such a reference, they are requested to contact the Webmaster so that appropriate action can be taken.